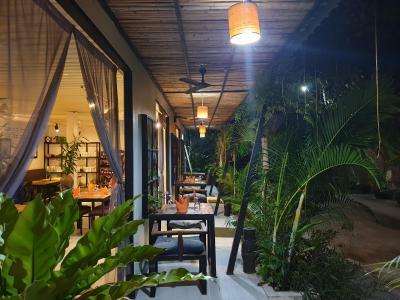 Lock in a great price for The Sanctuary Villa Battambang – rated 8.3 by recent guests! 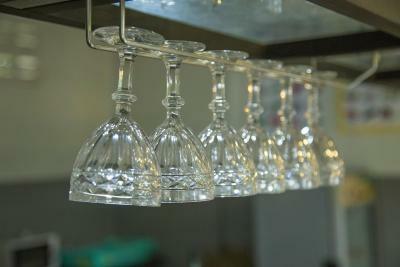 The staff was very courteous and friendly. The restaurant had great curry and noodle dishes. This is a family run hotel- helpful owner with lovely family. There was a city wide electrical outage- the owner comped our dinner. I was ill one day. The reception staff was very concerned and helpful. 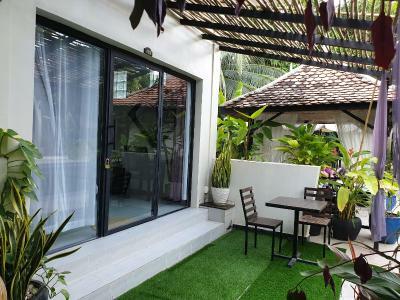 Really nice private bungalow, great value for money. Its quiet and a hidden gem in the busy dusty city. Super friendly and helpfull staff. And truly great restaurant staff with delicious fresh food options. Nice additional takeaway breakfast since i left before breakfast start time. I loved my room and the front staff service. eventhough it rained and my room started leaking I told the front desk and immediately they changed my room! Restaurant was very good. The surrounding gardens were lush and beautiful. Good pool. 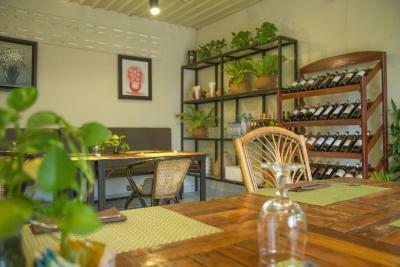 Quiet atmosphere and guests. Very friendly and helpful staff. Nice and green facility with lots of trees, plants and birds. Found lots of (small) spiders and bugs in the bathroom. Also they helped me to order an Airport taxi which costed 45$. The resort was quiet with wonderful gardens. The staff were super friendly and helpful. The room was quite nice and clean. 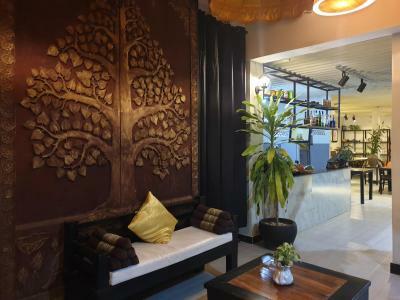 The Sanctuary Villa Battambang This rating is a reflection of how the property compares to the industry standard when it comes to price, facilities and services available. It's based on a self-evaluation by the property. Use this rating to help choose your stay! 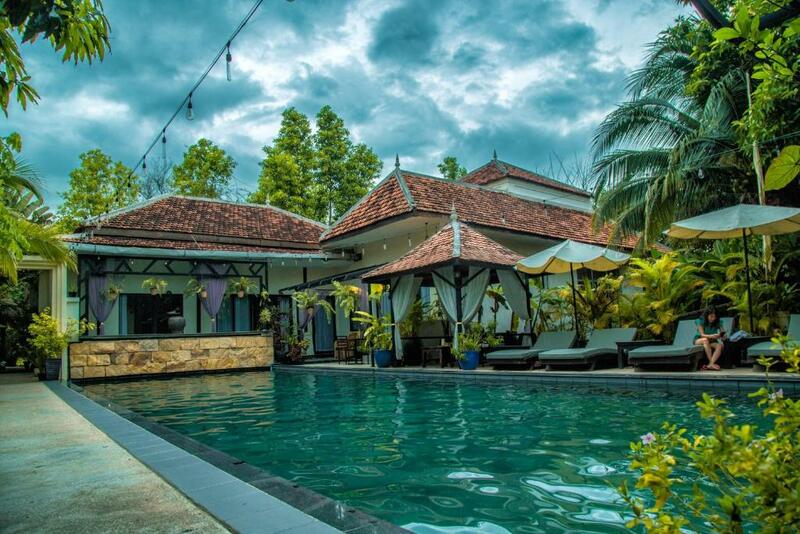 One of our top picks in Battambang.Designed to look like a Khmer Buddhist Temple, The Sanctuary Villa Battambang offers an outdoor pool. 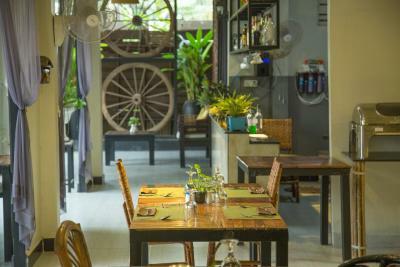 Fitted with free WiFi, air-conditioned villas present a mix of modern and traditional decor. 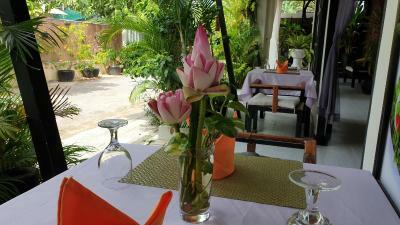 The Sanctuary Villa Battambang provides a free transfer from Battambang Bus and Boat Terminal. 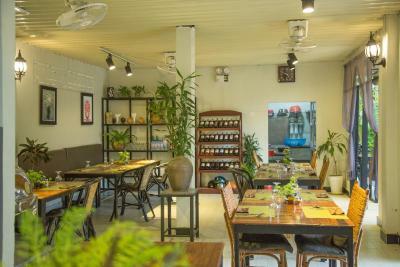 Via tuk-tuk, it is a 5-minute ride from the town area and a 15-minute ride from Bamboo Train Station. 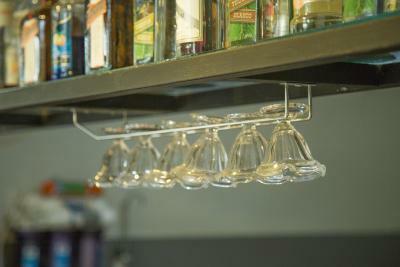 The property offers complimentary pickup services from the bus or train station. Dark wood furnishings and shades of golden-yellow give villas an elegant feel. All come with a flat-screen TV, DVD player and a mini-bar. Private bathrooms have a separate bathtub and walk-in shower. 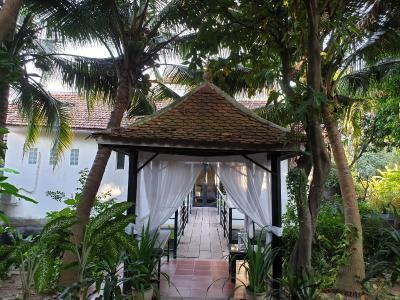 Leisurely afternoons can be spent with a traditional Khmer massage treatment. Day trips can be arranged at the tour desk. 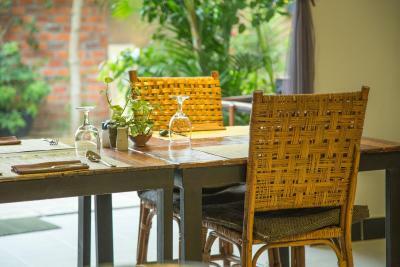 The property offers complimentary use of bicycles for guests who wish to explore the surrounding area. The semi-outdoor Oh Yeah! 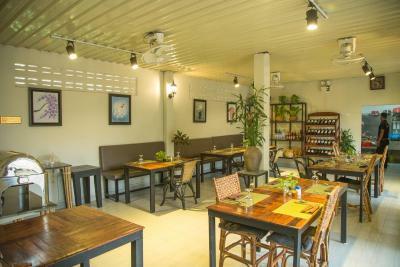 Restaurant serves a selection of Khmer, Thai and international dishes. 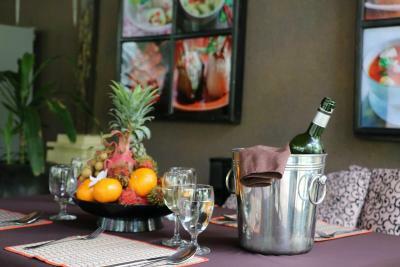 In-room dining is also possible with room service. 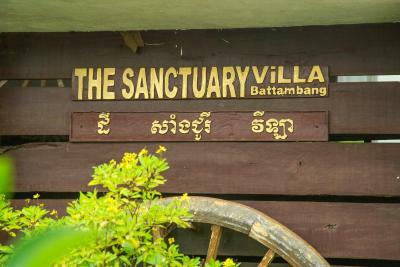 When would you like to stay at The Sanctuary Villa Battambang? 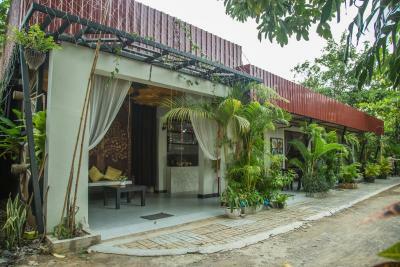 Spacious villa features traditional Khmer decor and a separate living room. Bathroom has a separate bathtub and walk-in shower. 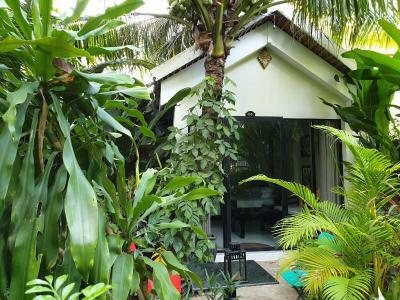 Featuring traditional Khmer decor, spacious villa comes with a separate living area and an outdoor hot tub. This villa features a balcony, sofa and soundproofing. 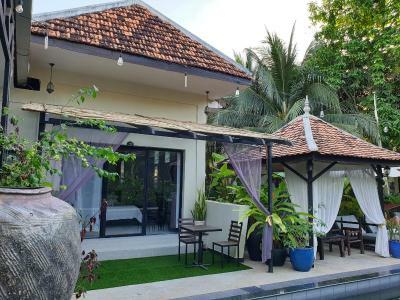 The Sanctuary Villa, Battambang Town, Cambodia Nested in a lushly green, peaceful, and strategically located within the charming town area of Battambang, The Sanctuary is truly a great base for travelers who wish to explore this local town and its surrounding attractions. 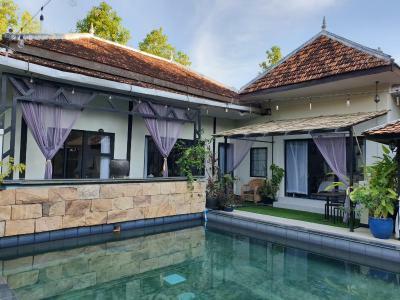 The Sanctuary only offers ten unique and individual tropical villas for single, double, triple or family occupies to ensure utmost comfort and privacy of our guests. 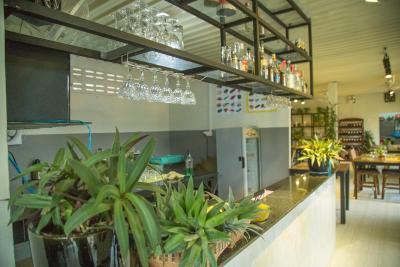 House Rules The Sanctuary Villa Battambang takes special requests – add in the next step! Free! One child under 11 years stays free of charge when using existing beds. 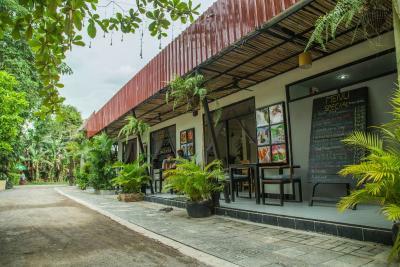 The Sanctuary Villa Battambang accepts these cards and reserves the right to temporarily hold an amount prior to arrival. - Complimentary two-way transfers from the bus or boat station. Guests are required to provide arrival details in advance using the Special Requests box available. The all thing is a bit decadent Far from center I had a frog under the bathroom drain making very loud noises until I flushed him out! 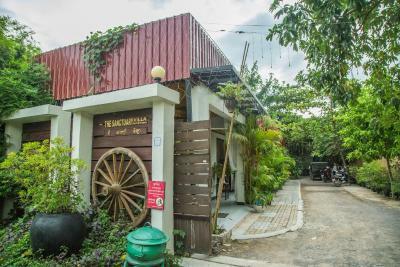 During the dry season, this hotel doesn't have backup generator as Cambodia is currently shortage of electricity, it will be cut off during the day time so guests cannot stay in the room during the day time. Moreover, the reused drinking water bottle is not good as it looked old without changing over a long time. There were alot of dead bugs in the bathroom. Changed three times. The only issues we had were gaps around the patio doors and insects & flying ants in the bathroom (but it is surrounded by a beautiful tropical garden so to be expected) and also repeated power cuts- 3 in 3 days. Can't be helped and could be due to the rainstorms but room was pretty hot until the air conditioning came back on. Also, i think we had one of the older rooms - other rooms had a lovely new spa bath, ours had a very old one, and no hot water. So bathroom is probably next in line for an upgrade. Everything else! Staff great, restaurant great -.both breakfast and dinner were delicious. Lots of choice at breakfast and even a packed breakfast on the day we left as we were leaving before breakfast started. Garden and pool beautiful. 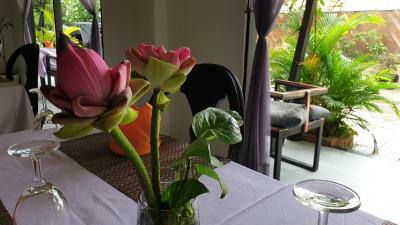 Nice quiet setting a bit out of town- but only $1 and a short tuktuk drive. Mr sam (the tuktuk driver is highly recommended for a day trip to the bamboo train and other local.sites). We had a great massage (organised via reception) and staff also arranged circus tickets for us - also highly recommended. Thanks for a great stay! A little far to walk to town in heat. But tuktuk transport is only $1. Owner has ordered solar panels to supply hotel during area wide power outages. Stuck in a corner room looking out on a wall. Bathroom was big however not welcoming nor did it have any toiletries. The pool was very inviting. Bikes available for free. Rooms a little tired but are clean. When accommodation full prone to power cuts in the evening. Breakfast buffet area cramped and ran out of coffee and orange juice quickly when busy as only one pot/jug available with about 14 guests seated. Very peaceful location. Pool area relaxing and towels supplied. Staff friendly and helpful. Food good. Bed, air conditioning and Wi-Fi good. Mosquito nets in room were used once during our stay. Liked the refillable water whenever you needed it. About a 10 minute walk into town. If you are a coffee freak better choose tea for breakfast and go to town to have your coffee afterwards! Small and quiet location a bit outside the town centre. Attentive and very kind staff. You may ask the receptionist for any kind of support (whether you need a bus ticket with hotel pickup to your next destination or a ticket for any performance to visit or whatever). 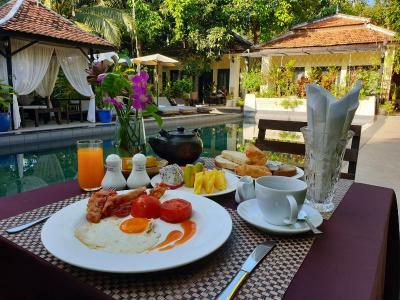 You can choose you breakfast from a buffet which is not normal standard in Cambodia. The restaurant can be recommended, too. The breakfast had more potential. It was a buffet-style breakfast but everything was empty almost everytime (fruit, coffee, tea, water). Resulting in us having to ask for every part of breakfast. Maybe better to serve the breakfast or to make sure the buffet is filled. It is a lovely accomodation just a bit out of the city centre. 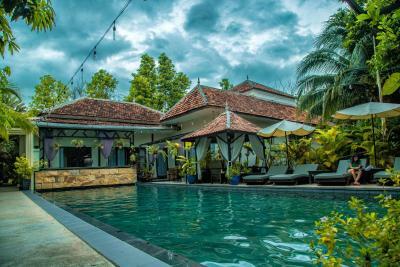 The surroundings are very tranquil and the pool is quite big. The biggest we had during our stay in Cambodia for the resort of this size. Battambang and it surroundings are worth exploring. The hotel accomodates different kinds of transportation from tuktuk to a scooter (both charged) or bicycles (free). The location of the accommodation is a bit out of the city center, the only down side. Great staff, great houses (bit old, but no problem), nice pool. Free bikes we took use of for two early morning excursions ..one north to Ek Phnom via the river and forest and one south with a little diversion ..Google maps off line ... brilliant..Pool was perfect to cool off in.